This name uses Spanish naming customs: the first or paternal family name is Busquets and the second or maternal family name is Burgos. Sergio Busquets Burgos (Catalan: [busˈkɛts], Spanish: [ˈseɾxjo βusˈkets];[A] born 16 July 1988) is a Spanish professional footballer who plays as a defensive midfielder for Barcelona and the Spain national team. A one-club man, he arrived in Barcelona's first team in July 2008, and eventually made a name for himself in a relatively short period of time. He reached the Spain national team less than one year after making his senior club debut. Busquets helped Spain win the 2010 World Cup and the Euro 2012 tournaments. He also represented the nation at two other World Cups and Euro 2016. Born in Sabadell, Barcelona, Catalonia, Busquets began playing football with local team CD Badia del Vallès, followed by spells with CEF Barberà Andalucía, UE Lleida and UFB Jàbac Terrassa, before joining Barcelona's youth ranks in 2005. He scored seven goals in 26 games for the Juvenil A team in his second season and, two years later, Busquets was promoted to the B team under Pep Guardiola, and helped him achieve promotion to the third division. In that same season he would make his first-team debut, coming on as a substitute in the Copa Catalunya. "Positionally, he seems like a veteran with or without the ball. With the ball he makes what is difficult look easy: he disposes of the ball with one or two touches. Without the ball, he gives us a lesson: that of being in the right place to intercept and running just to recover the ball." On 13 September 2008, Busquets played his first La Liga match, featuring 90 minutes in a 1–1 home draw to Racing de Santander. During Barcelona's UEFA Champions League clash against Basel at St. Jakob-Park on 22 October 2008, he scored the second goal in the 15th minute in a 5–0 group stage win; in early December, in another start, he scored his second with Barça in the competition, netting in the 83rd minute of a 2–3 home loss against Shaktar Donetsk. On 22 December 2008, Busquets signed a contract extension until 2013 with a buy-out clause of €80 million. On 7 March 2009 he scored his first league goal, in a 2–0 home win over Athletic Bilbao. On 27 May, having been regularly played as he competed for the spot with internationals Seydou Keita and Yaya Touré, he also featured in Barcelona's starting eleven in the Champions League final, a 2–0 win over Manchester United; with that victory, Carles and Sergio Busquets became only the third father-and-son combo to both have won Europe's top club competition playing for the same team, joining Manuel Sanchís Martínez and Manuel Sanchís Hontiyuelo (won it with Real Madrid) and Cesare Maldini and Paolo Maldini (A.C. Milan). Busquets' fine form continued in the 2009–10 campaign, with Guardiola preferring him to Touré as Barcelona's central holding midfielder. In the Champions League semi-final against Inter Milan at Camp Nou on 28 April 2010, he went down to the ground after Thiago Motta had raised his arm and appeared to push Busquets directly in the face. As a result of this action, the former was shown a red card and dismissed for violent conduct, whilst the latter was subsequently criticised by both Motta and the media for apparently feigning injury. Busquets was again ever-present in 2010–11, even playing as a central defender on occasion. On 27 January 2011, he signed a contract extension that would keep him at the club until 2015 – the buyout clause was increased to €150 million. On 8 March, playing at centre back, he scored an own goal from a corner kick against Arsenal, in the season's Champions League round-of-16, levelling the score at 1–1; Barcelona eventually won the game 3–1 (and 4–3 on aggregate). On 24 April 2012, Busquets scored a rare goal – only his sixth official one in four years – netting from an easy tap-in after an Isaac Cuenca cross to make it 1–0 for the hosts in the second leg of the Champions League semi-finals against Chelsea. Barcelona could only draw 2–2 against ten men, losing 2–3 on aggregate. On 16 July 2013, the day he celebrated his 25th birthday, Busquets agreed to a new deal until 2018, with the buyout clause remaining unaltered. On 1 August 2014, after the retirement of Carles Puyol and at the veteran's personal request, he was given the number 5 shirt for the upcoming campaign. On 6 June 2015, Busquets started in the final of the Champions League, as the team won their fifth accolade in the competition by beating Juventus at Berlin's Olympiastadion. This made Barcelona the first club in history to win the treble of domestic league, domestic cup and European Cup twice, and Dani Alves, Busquets, Andrés Iniesta, Lionel Messi, Pedro, Gerard Piqué and Xavi the only players to achieve the same feat. On 1 October 2017, Busquets opened the scoring in a 3–0 home win against Las Palmas which was played with closed doors at the Camp Nou due to the ongoing Catalan independence referendum. 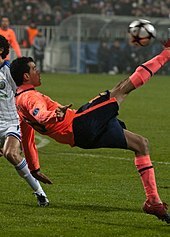 On 11 December 2018, Busquets made his 100th Champions League appearance by starting in the final Group B match against Tottenham Hotspur which ended in a 1–1 home draw. On 11 October 2008, Busquets earned his first cap for Spain's under-21 in their 2009 UEFA European Under-21 Football Championship qualification play-offs first-leg away match against Switzerland. He scored in the 17th minute of a 1–2 loss, though they eventually emerged victorious 4–3 on aggregate. On 11 February 2009, Busquets was called up to the senior squad for a friendly against England. He was named as a substitute for a 2010 FIFA World Cup qualifier against Turkey on 28 March 2009, making his debut in the return match on 1 April, playing 16 minutes in a 2–1 win in Istanbul after replacing David Silva. "If I were a player, I would like to be like Busquets." Busquets was selected by manager Vicente del Bosque for the 2010 World Cup in South Africa, assuming the holding midfielder role naturalized Brazilian Marcos Senna had previously occupied in the conquest of UEFA Euro 2008. He played all of the tournament's games and minutes for the eventual world champions, save the last 30 minutes of the 0–1 group-stage loss against Switzerland. On 8 September 2014, Busquets scored his first international goal in a 5–1 win over Macedonia during Euro 2016's qualifying phase. His second came during the same tournament on 15 November, in the 3–0 defeat of Belarus in Huelva. Busquets celebrated his 100th appearance for Spain on 9 October 2017, in a 1–0 away win against Israel for the 2018 World Cup qualifiers. Subsequently, he was named in Julen Lopetegui's squad for the finals in Russia. "He's one of the greatest talents that has been given to Spanish football. This is a discovery. The first time I saw Busquets playing, I called a friend and said: ‘I saw a player from an extinct species’. He's a star." Busquets is usually deployed as either a central or defensive midfielder, although he is also capable of playing as a central defender. A hard-working player, he excels at intercepting loose balls and breaking down opposition plays due to his positional sense, defensive attributes, tactical intelligence, and ability to read the game. Due to his vision, ball control, physical prowess, technical skills and accurate passing ability, he rarely relinquishes possession, and alongside both his current and former midfield teammates, such as Iniesta, Xavi and Ivan Rakitić, he has also played an important creative role in setting his team's tempo in midfield as a deep-lying playmaker through his passing game. Manager del Bosque praised Busquets, saying, "If you watch the whole game, you won't see Busquets—but watch Busquets, and you will see the whole game." The latter's height also allowed him to be effective in the air, and enabled him to advance into more offensive positions on occasion, providing an additional attacking outlet for his team. Busquets was largely accused of diving by the media on a number of occasions, due to opposition players being wrongly booked or even sent-off during the game because of his excessive play-acting and protests. However, in response to these criticisms, he defended diving in football as intelligent play. Often considered to be one of the most underrated footballers in the world, Busquets earned praise from his peers, with Messi saying "When there will be trouble, he (Busquets) will be there." Busquets' father, Carles, was also a footballer. He played as a goalkeeper for Barcelona for several years during the 1990s, although almost exclusively as a backup. In 2014, Busquets started a relationship with Elena Galera. In 2016, the couple welcomed their son Enzo. He sported an Arabic tattoo on his left forearm translating to "A thing for you, the life in my country", dedicated to his maternal grandfather to whom he was very close. ^ In isolation, Busquets is pronounced [busˈkets]. ^ a b c "Sergio Busquets". FC Barcelona. Retrieved 8 May 2017. ^ "How to pronounce Carles Busquets". Forvo. 12 October 2008. Retrieved 11 May 2018. ^ "Trata de arrancarlo, Pep" [Get this thing started, Pep] (in Spanish). Madrid: Marca. 13 September 2008. Retrieved 9 July 2014. ^ "Basel overwhelmed by five-star Barça". UEFA. 22 October 2008. Retrieved 22 October 2008. ^ "Shakhtar brush aside youthful Barcelona". UEFA. 9 December 2008. Retrieved 15 January 2010. ^ "Busquets thrilled to commit future to Barça". UEFA. 22 December 2008. Retrieved 22 December 2008. ^ "Busquets signs new Barcelona contract". Tribal Football. 23 December 2008. Archived from the original on 27 December 2008. Retrieved 23 December 2008. ^ "Vuelve el espectáculo" [Showtime is back] (in Spanish). Marca. 7 March 2009. Retrieved 8 May 2017. ^ "Los Busquets hacen historia" [The Busquets make history] (in Spanish). Mundo Deportivo. 29 May 2009. Retrieved 8 May 2017. ^ a b Mole, Giles (29 April 2010). "Barcelona v Inter Milan: Thiago Motta fumes at Sergio Busquets' 'terrible behaviour'". London: The Daily Telegraph. Retrieved 29 April 2010. ^ Lyon, Sam (28 April 2010). "Barcelona 1–0 Inter Milan (agg 2–3)". BBC Sport. Retrieved 9 August 2014. ^ Jenson, Pete (30 April 2010). "Banned Motta asks Uefa to act over Busquets 'theatre'". London: The Independent. Retrieved 29 April 2010. ^ Hayward, Paul (2 May 2010). "Fair Play 0, Foul Play 1 – a cynical classic from the Camp Nou conmen". The Guardian. Retrieved 25 July 2014. ^ "'Ya sabemos que Busquets es un inútil'" ['We all know that Busquets is worthless'] (in Spanish). El Mundo. 16 September 2011. Retrieved 8 May 2017. ^ "El día que Sergio Busquets y Mascherano se ordenaron" [The day Sergio Busquets and Mascherano got it together] (in Spanish). Diario AS. 15 March 2016. Retrieved 8 May 2017. ^ "Brilliant Barcelona outgun ten-man Arsenal". UEFA. 8 March 2011. Retrieved 9 March 2011. ^ "Barcelona renews Sergio Busquets' contract through 2018". New York: Sports Illustrated. 16 July 2013. Retrieved 23 October 2013. ^ "Busquets inherits Puyol's number 5 shirt". Marca. 1 August 2014. Retrieved 8 May 2017. ^ "Lionel Messi scores twice as Catalan giants forget referendum chaos". The Sun. 1 October 2017. Retrieved 2 October 2017. ^ "Sergio reaches Champions League century". FC Barcelona. 13 December 2018. Retrieved 31 March 2019. ^ "España sub'21 cae en Suiza y emplaza la clasificación para la vuelta" [Spain under-21 fall in Switzerland and postpone qualification to second leg] (in Spanish). El Confidencial. 11 October 2008. Retrieved 8 May 2017. ^ "Crónica del España-Suiza, 3–1" [Spain-Switzerland match report, 3–1] (in Spanish). Europa Press. 15 October 2008. Retrieved 8 May 2017. ^ "Lista de convocados para el amistoso ante Inglaterra" [Callup for friendly against England] (in Spanish). Royal Spanish Football Federation. 6 February 2009. Archived from the original on 10 February 2009. Retrieved 6 February 2009. ^ "Crónica del España – Turquía: 1–0" [Spain – Turkey match report: 1–0] (in Spanish). Europa Press. 29 March 2009. Retrieved 8 May 2017. ^ "España remonta en Turquía e iguala el récord de Javier Clemente (1–2)" [Spain come from behind in Turkey and equal Javier Clemente record (1–2)] (in Spanish). 20 minutos. 1 April 2009. Retrieved 8 May 2017. ^ "Busquets espera estar a la altura de Marcos Senna" [Busquets hopes to live up to Marcos Senna] (in Spanish). Marca. 28 May 2010. Retrieved 8 May 2017. ^ "Swiss happy to accept Spanish 'gift'". FIFA. 16 June 2010. Retrieved 8 May 2017. ^ "Euro 2016 qualifiers: Spain back in groove with easy win over Macedonia". London: The Guardian. 8 September 2014. Retrieved 9 September 2014. ^ "Un golazo de Illarra premia a España" [Illarra wonder goal rewards Spain] (in Spanish). Marca. 9 October 2017. Retrieved 9 October 2017. ^ "Chelsea forward Álvaro Morata left out of Spain's World Cup squad". The Guardian. 21 May 2018. Retrieved 22 May 2018. ^ a b "Sergio Busquets Burgos". FC Barcelona. Retrieved 26 January 2015. ^ a b "Sergio Busquets: Barcelona's best supporting actor sets the stage". London: The Guardian. 27 May 2011. Retrieved 26 January 2015. ^ "Barcelona's Pep Guardiola: Sergio Busquets is the best defensive midfielder in the world". Goal. 15 January 2012. Retrieved 26 January 2018. ^ Cox, Michael (12 May 2015). "Champions League semis showcase changing role of deep-lying midfielder". ESPN FC. Retrieved 30 January 2017. ^ ""Busquets? The most intelligent player I have ever coached", says Luis Enrique". We Love Barça. 20 November 2015. Retrieved 26 January 2018. ^ Cox, Michael (23 August 2016). "Disappointing lack of deep-lying playmakers in the Premier League". ESPN FC. Retrieved 28 February 2017. ^ Shahin, Ahmed (21 March 2015). "FC Barcelona v Real Madrid CF: El Clásico combined XI – When stars collide". Barca Blaugranes. Retrieved 26 May 2015. ^ Cernensek, Bostjan (31 March 2011). "Getting To Know: Sergio Busquets". Barca Blaugranes. Retrieved 30 July 2016. ^ "Busquets: "Play-acting? It's being smart"". Madrid: Marca. 10 September 2013. Retrieved 3 June 2015. ^ Kunal (22 February 2018). "Why Sergio Busquets is the most underrated midfielder". Blame Football. Retrieved 29 September 2018. ^ Coleman, Joe (14 September 2018). "ENFORCER Lionel Messi knew Sergio Busquets was good enough for Barcelona after three days of training, claims Pep Guardiola". Talksport. Retrieved 29 September 2018. ^ "The Arabic tattoo of Busquets". FC Barcelona Blog. 25 October 2008. Retrieved 2 July 2017. ^ "Busquets: Sergio Busquets Burgos: 2008–09". BDFutbol. Retrieved 3 April 2017. ^ a b c d e f g h i j k "Sergio Busquets". Soccerway. Retrieved 19 February 2018. ^ a b "Sergio Busquets". European Football. Retrieved 8 May 2017. ^ "Atletico dominate UEFA's La Liga team of the season". Marca. 16 May 2016. Retrieved 30 September 2017. ^ "Los campeones del mundo de fútbol ya tienen la Real Orden del Mérito Deportivo" [The football World Champions already have the Royal Order of Sporting Merit] (in Spanish). Barcelona: Mundo Deportivo. 5 January 2011. Wikimedia Commons has media related to Sergio Busquets.